Released by Duffy Films, Inc. The first quickie cash-in on the Tate-LoBianco killings, THE CULT was made in California sometime in 1970 by a producer and director who hid behind pseudonyms and never did reveal their true identities (Cinematographer Robert Maxwell, who had previously shot THE RAMRODDER, a softcore western that was filmed at the Spahn Ranch and co-starred Manson associates Bobby Beausoleil and Catherine Share, died in 1978 at age 54). The word on the street is that Albert Zugsmith was "Kentucky Jones," and his involvement with increasingly seedy product around this time seems to back up the rumors. THE CULT was acquired for release by Maron Films Ltd., the new company formed by veteran New York distributor Mel Maron, a former sales manager for MGM and UPA. Some of the films released by Maron Films include B.J. LANG PRESENTS, DAUGHTERS OF DARKNESS, GODZILLA’S REVENGE, ISLAND OF THE BURNING DOOMED, TOWER OF SCREAMING VIRGINS, TOYS ARE NOT FOR CHILDREN, and NEXT! 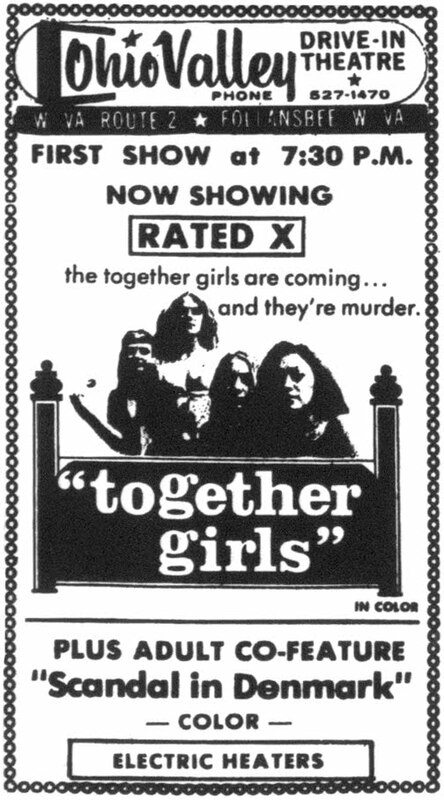 Maron also started a subsidiary company, Duffy Films Inc., to handle soft-X features like THE CULT, which was set to premiere in Philadelphia on February 26th, 1971 (It opened in Atlanta the following March as THE LOVE CULT, and made the rounds as TOGETHER GIRLS in early 1973). Despite a splashy start, Maron Films was in Chapter 11 bankruptcy by August of 1972, and Maron moved on to a sales manager position at Group 1 Films; he later was the president of Cinema Shares, World Northal, Almi Pictures and finally Castle Hill Productions. 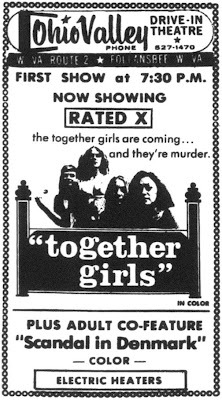 THE CULT languished in obscurity until shortly after the TV movie HELTER SKELTER hit the airwaves in April of 1976, when it reappeared as THE MANSON MASSACRE from Boston-based distributors Newport/Hallmark, who kept it on double and triple bills into the 1980s. As of now, the only version of THE CULT that is available is a German-language print with no English sub-titles. Hopefully a print with the original English language soundtrack will surface eventually. THE MANSON MASSACRE is an assault on the sensibilities. One-third of the film is devoted to Ivor, the film’s pseudonym for Charles Manson, picking up the girls who are to become members of his “family.” One-third delves into the psychological reasons why the girls are attracted to him and the psychological reasons behind his actions. The final third is devoted to the “family’s” murders. In THE MANSON MASSACRE, the murders are accomplished not only with knives but also with whips and instruments of medieval torture. Along with the usual blood and gore, there are also gouged-out eyeballs brightening the screen. Two-thirds of the film are in color. The flashbacks, giving the reasons why family members act the way they do, are in stark black and white. That is all they deserve. Ivor, for instance, turned out the way he did because he hates his mother. Why? The hate grew out of an incestuous relationship with her. I was the only one in the theater for a weekday matinee performance. That's my old hometown paper! Alas, I was still but a child in those days, so I had no chance to be ripped off like that irate reader. But I guess they figured out a way to stop that false advertising in the end, didn't they? I wish that these comments were dated. They could have been posted yesterday, or five years ago. If MANSON MASSACRE may appear "sooner," it would help to know when the comment was posted. I saw the film back in 1976, when it was the co-feature with TWITCH OF THE DEATH NERVE. Well, I saw the last ten minutes of it, because I was mainly there to see TWITCH. I didn't really like TWITCH very much, so I left the downtown urban hardtop theater without staying through the rest of MANSON MASSACRE. At least, I've seen the German VHS, but I'd certainly like to see an English language print of the film. There's a good chance that Albert Zugsmith had something to do with this one.